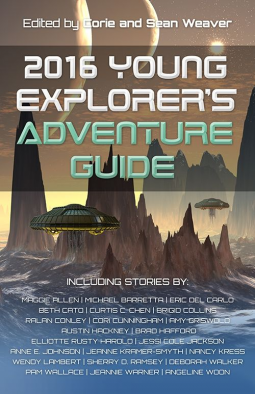 The 2016 Young Explorer's Adventure Guide is the second collection of science fiction short stories aimed at middle grade readers. The first, of course, is the 2015 Young Explorer's Adventure Guide. I highly recommend this collection. I love the variety of "young voices" it contains as well. From kids making first contact to piloting starships the range of adventure is fantastic. I treated myself to one or two a day and am definitely going to read the 2015 edition. The only thing I didn't like is the collection contains almost exclusively (if not completely) female lead characters. I would have preferred a balance. In spite of this, it's still a first class read. Oh, and it has Nancy Kress!